What could be better than a Halloween-themed Go Guess lobby? Probably nothing. Except maybe our Leaderboard Contest, which is live now! In the Go Guess Leaderboard Contest, you can earn up to $45 this week in Amazon gift cards just by playing the social, geographic guessing game you love on your Oculus Rift or HTC Vive. More details on the Leaderboard Contest can be found at the link above and in the image below. Good luck and we’ll see you in Go Guess! We’re excited to announce that Go Guess is now available for the HTC Vive on Steam! We can’t wait for those of you with HTC Vives to be able to play Go Guess, especially with Multiplayer now live. You can always check out the full release notes for updates on our Steam Community Hub and feel free to reach out to us at contact@oblixvr.com with any feedback, feature suggestions or just to say hi! Until next time, happy exploring! Firstly, we've just launched Challenge Multiplayer, which lets you play Go Guess with up to four people simultaneously. So gather your friends (or make new ones in Go Guess) and discover the world together with a bit of competitive gameplay to keep things exciting. Secondly, Go Guess is now live on the Oculus Store. We can't wait to reach more users through the Oculus Store, especially with Multiplayer in tow. If you're curious, check out the full release notes in our Steam Community Hub and, as always, feel free to reach out to us at contact@oblixvr.com with any feedback, feature suggestions or just to say hi. Until next time, happy guessing! Why not have fireworks every day of the year? Now, in VR, you can. We added fireworks to our Times Square lobby (pictured above) for the 4th of July festivities, but we're going to keep them around - at least for a while. So jump into Go Guess to check them out! This update also brings individual user accounts to Go Guess, so take ownership now of a name you like to go by and pair that name with your snazzy, custom avatar as made possible in our last update. Plus, we've added the ability to view daily, weekly and monthly leaderboards in addition to all-time leaderboards. If you're interested, you can check out the full release notes in our Steam Community Hub. Always feel free to reach out to us at contact@oblixvr.com with feedback, feature requests, or just to say hi - and we'll see you in Go Guess! P.S. If you haven't downloaded Go Guess yet, visit our Steam page where you can download it for free. Hello, Friends of Go Guess! We recently launched an update to Go Guess, which includes the ability to customize your avatar. We've done the math, and there are nearly a septillion possible combinations of avatars (that's a trillion trillion). You can see some of those possible combinations in the GIF above. To customize your avatar, just jump into Go Guess after updating and you'll see a big "AVATARS!" sign in front of you. If you click that sign, you'll enter the changing room pictured above where you can customize away. There are few minor updates and bug fixes in this release too. You can find detailed release notes in our Steam community hub if you're interested. As always, feel free to reach out to us at contact@oblixvr.com with any feedback, feature requests or just to say hi - and if you don't have Go Guess yet, you can download it on Steam. Until next time - happy exploring, folks! Alright! Today is the day! Today, we are excited to launch Go Guess, a geographic guessing game for ants. Just kidding... A geographic guessing game (for humans). Go Guess is available now on Steam for Oculus Rift. If you're waiting for support for other headsets, stay tuned, and feel free to get in touch to let us know. We have always been committed to helping people explore the real world in virtual reality. Go Guess brings us one step closer to that mission and does so in a fun, engaging way for people of all age groups. In Go Guess, you are placed in a semi-randomized, real-world location and you're asked to guess where in the world you are. 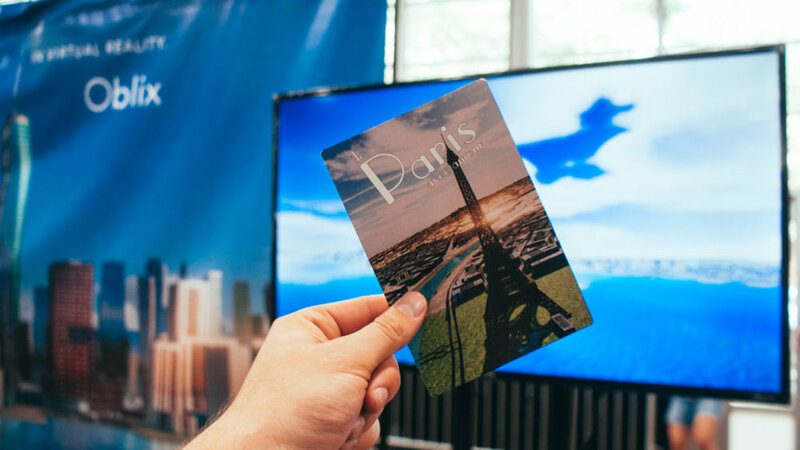 You'll be rewarded with points based on the proximity of your guess to the true location. Plus, we have leaderboards and avatar-based social interaction, so you can hang out in the lobby with friends and compete with others for glory. We're excited to hear any feedback you may have, so please feel free to reach out to us at support@oblixvr.com with your thoughts. We're committed to continuing to improving the experience for you, so stay tuned for updates and reach out with any feature requests. Our team had a blast exhibiting at the New York Virtual Reality Expo at the Jacob Javits Center on October 27th and 28th! This was the second public demonstration of a pre-launch version of Oblix’s Oculus Rift application (see our Worlds Fair Nano post on the first public demo). 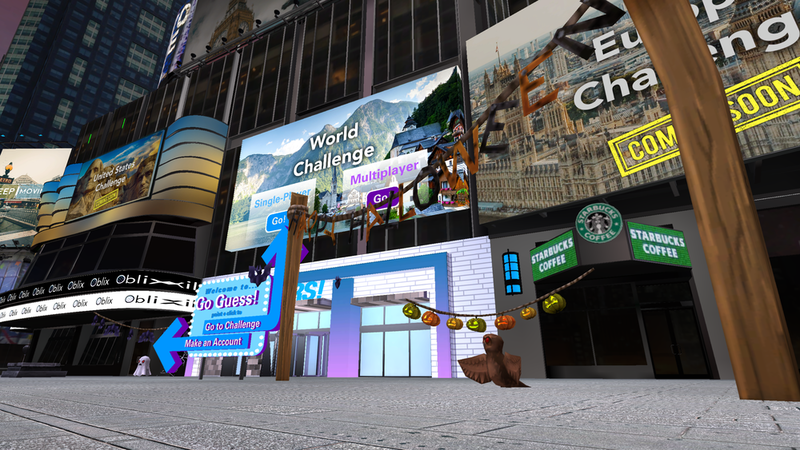 In this demo, participants were able to fly around a virtual recreation of New York and jump in and out of 360° photos and videos that were geo-referenced within the world. We also participated in the Startup Pitch Competition at the NYVR Expo (photo below) along with our colleagues from SpaceoutVR, Datavized, StreetSmarts VR, Geopipe, Membit, VirtualAPT, Garou, VRGlobal, WaVR, m3diate and 3D Apartments. 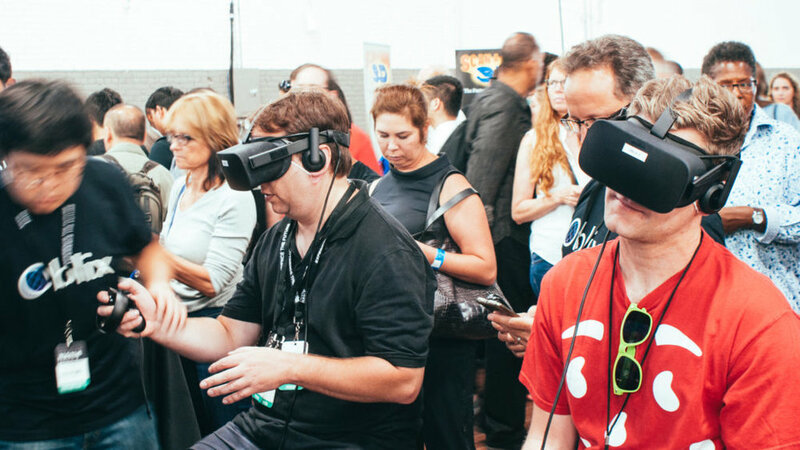 We want to extend a big thank you to all of the organizers of the NYVR Expo, including our friends at The Glimpse Group, for putting on the premier showcase of VR and AR technology in New York thus far. We’re looking forward to attending future NYVR Expos. We also want to thank everyone who participated in our demo and provided invaluable feedback to help us improve our product. For those of you who are based in the New York area and want to get involved in the virtual reality community here, we highly recommend the monthly NYVR Meetup, which led to the creation of this expo. Check out the video above and the photos below for a recap of the event! Two participants demo Oblix’s application using Oculus Rift headsets and Oculus Touch controllers. An NYVR Expo attendee tries the Oblix app with a view of Oblix’s banner in the background. Siddharth Saxena (Oblix, CEO & Product Architect) and Andy Vadapalli (Oblix, Director of Operations and Business Development) speaking in the Startup Pitch Competition. Our initial release for iOS leveraged the power of virtual reality technology to bring our users into outer space. Users could view all planets in the solar system using just their iPhone and a simple Google Cardboard viewer. This was much cheaper than a ticket on an orbital-class space vehicle. We have always been committed to using virtual reality as a means to explore our real surroundings, rather than immerse ourselves in fictional spaces. With Version 1.1 of our iOS app, we are reinforcing our commitment to enabling exploration of real spaces in virtual reality, but with a focus on the planet we all call home: Planet Earth. Users will still be able to view and travel to other planets in the solar system; we haven’t removed any of those features. However, while Earth remains the only planet in our solar system known to be capable of accommodating life, we view it as the most interesting planet to explore. In this release, we’ve added a feature called Oblix Home where users will begin their journey through the Oblix app. Within Oblix Home, users will be able to choose from a variety of destinations. If you want to access other planets, just look towards the stars. Please stay tuned for updates to this iOS app and for Oblix’s debut on other virtual reality platforms. If you have any feedback for us, we’d love to hear from you at support@oblixvr.com or through the form on our website. Until next time – happy exploring! Our universe is inherently richer and more complex than any fictional one can ever be. Oblix is the best way to travel our universe in virtual reality, or VR. With Oblix, VR functions as a tool that allows you to immerse yourself more deeply in reality, rather than escape it. Travel from Earth to Mars and to other planets. Witness the movements of our solar system and the might of our burning Sun. Pioneer the final frontier. Oblix can be downloaded for iPhone from the App Store for free. In order to use the app, you’ll need a Google Cardboard viewer. Oblix will also be launching on other virtual reality hardware platforms, including Gear VR and Oculus Rift, with many new features, so stay tuned for those updates! If you have any questions or feedback, you can reach out to us at support@oblixvr.com or use the form on our website. In the meantime, happy exploring!